Black Beauty montage with mockups. LHS: Rear concept – RHS: Original horse truck now extended up, down and back – Bottom: An early marketing concept on sides. Click to view fullsize. This post updates my personal situation with latest news from New Zealand – Mr Palemia banned me from Samoa in September 2016, I have been building a housetruck and mobile recording/blogging studio, my [physical] heart has failed and I’m helping others in various ways with my new business, Writing the Wrong. If you haven’t caught up with the latest in relation to yours truly getting exported from Samoa, don’t feel bad about it – I haven’t shouted about it. Lord knows I wanted to, but I felt it more appropriate to let the Prime Minister of Samoa have his way without making a scene at the time. That means that I’ve been sucking it all up for the last nine months . . . till now anyway. A lot will be coming out in the next few weeks! In Q2, 2015, Samoa’s Palemia, Tuila’epa took exception to a book I wrote called Corruption in Samoa. I wrote it for him and of course gave him a copy of it. For two years he is the only one who has ever read it. He flipped out over it, not because of the various government departments I pinged, but because I alluded to his ‘inappropriate’ relationship with Papalii Sonja Hunter, his CEO of tourism. While most in Samoa know that these two are “close” (which is how they discuss it respectfully in Samoan society), it is rarely spoken about how far the relationship goes/went. He ripped me off over it (more detail in other places but basically it’s not a good idea to screw me, especially when you’re the PM with things you want to hide). So, the Big Man ‘reviewed’ my immigration status; got me flicked and is laughing all the way to the bank bedroom. The way he did it was kinda cute . . . illegally, immorally and typical of a coward but the end result is that since 5 September 2016, I have been back in New Zealand and have lost all – wife, three step-children, everything I owned and I only have my word and integrity left. Whatever! Life goes on . . . When I got banned, I didn’t know what was happening at the time. They way Tuila’epa did it was to issue the Prohibition Order secretly, get his Immigration staff to hide it, then slip a letter to all the carriers referring to the Order (but not actually sending it out to them) to prevent me from returning, then force me to leave the country (under false pretenses) and then sit back knowing that I would never return because I couldn’t! For the next ten days following getting bumped at the airport, I worked out what had happened and determined that it was better to start afresh in New Zealand. 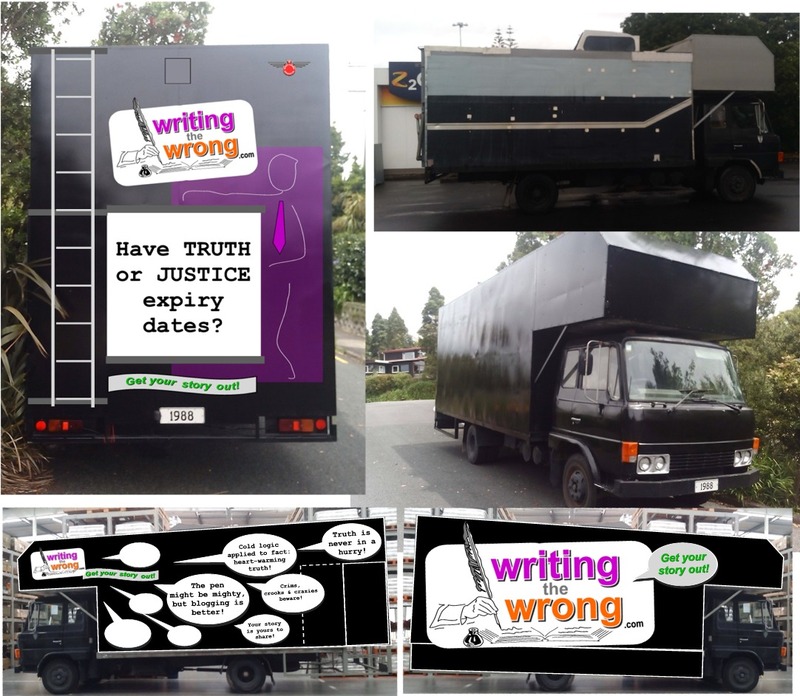 I would have appreciated actually knowing, but at that stage I didn’t know when or or how or if things would shake down in regards to Samoa or my wife and family, so I bought an old horse truck that had been started to be converted into a housetruck and kitted it out for a mobile blogging studio. I wanted it ready in case we decided to travel New Zealand. As it turned out they chose to stay and I’m currently most of the way through converting it into a combined business marketing unit. Plan B, or C, or D, depending on how you look at it! I’ve called it “Black Beauty” and the main thing that people say about it when they see it it “Wow! It’s HUGE!” mainly because of the large sides I’ve made. To get maximum signage, I’ve lifted the sides by half a metre, and dropped them down by over half a metre. I’ve also extended it out by a metre to the maximum legal limit, which gives me a nice stairwell and plenty of room inside. The rear also has an access door that doubles as signage with eight sheets of coloursteel for easy swapping and changing messages as I wish. I have a tall 6.5m Internet pole, a rear ladder to the roof, solar panel, a huge 240 Ahr Deep cycle battery, a 4k inverter and generator. Cooking is gas and a fullsize recycled kitchen that I picked up on TradeMe for a buck! At the front over the cab is sleeping for three adults. Next backwards is the recording studio – carpeted on ceiling and walls for sound, seating and recording for up to six and a folding table. Then comes an office and kitchen on the right, and refrigeration, shower/toilet and washing machine on the left. Water is gravity fed from two 200litre tanks in the ceiling! Having the capacity in the extended space up, the strength and carrying capacity and experience with boats and the hassle of water pumps, I wanted nothing to do with them on a day-to-day basis. The truck is an old Hino FD174, well recognised as a great workhorse and certified up to 13 tons! In Samoa I developed the Writing the Wrong brand ready for another person (a journalist and investigator) to run with. She chose to do other things upon my departure so I developed it into a New Zealand based brand and business. I’ve established the company and the infrastructure, and it has been Trade Mark approved in New Zealand and all going well, in a few months it will be confirmed (it takes six months for the notification period). The companies by-line is “Get your story out!” and the business can morph into whatever shape the people want – blogging, marketing, investigation, journalism, advocacy and so on. I’m also happy to even play with signwriting or exhibitions if that is appropriate. Once the truck is pretty much complete, I’ll be developing the business plans with government support using the help of some “get-off-the-dole-and-into-self-employment” assistance scheme they offer. Then the signs will go on Black Beauty and we’ll be “In business and with a plan!” probably around about a year after having gotten booted out of Samoa. Not particularly fast progress for me, but OK in my circumstances. 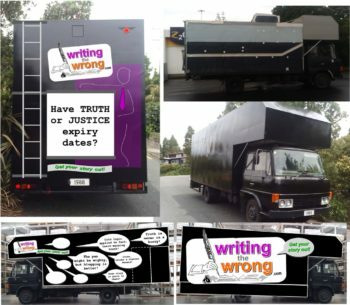 In the meantime, Writing the Wrong has been helping some people with their court cases, we’ve done the BBX Investigation which was a good couple of months of non-commercial part-time investigation and blogging with criminal charges already laid with civil cases to come once the criminal ones are dealt with. I’m really learning how things work back here in New Zealand after seven years in the bush in Samoa! I’ll be taking on Bartercard through the same methods I used against BBX later in 2017 – I did the primary investigation into Bartercard when I was in Samoa, and I’ll be taking them to court (both civil and yes, criminal too) over their Ponzi scheme, plus releasing the book Bartercard Secrets and doing some online work supporting this all. I’m also in the early stages of working with others with oyo.nz a concept that connects farmers with investors. More on that once we have the ideas firmed up. So . . . to the medical thing. The big bad news is that I have suffered heart failure. I’m on the standard medications in this sort of situation – a cocktail of pills that slow and steady my heart rate. Medical stuff is not my cuppa tea – I generally handle it when I have to and keep on trucking along healthily year after year, but heart failure is a little more serious. I am and have been only operating at half speed since my return to New Zealand. My aging father says that this means that I’m still probably producing at the same rate as most others, but it is a big difference for me nonetheless! As far as we (the medics and I) can deduce, the root cause was a ‘low-level virus’ (whatever that means) that I picked up in Samoa around the time I was assaulted by the Satapuala Matai, Eniko Taufete’e. This appears to have triggered Atrial Fibrillation, which is an irregular heartbeat. I noticed this a few times when I was working in the plantation up there but it was probably intermittent and didn’t have any significant affect on me. What did happen though was that when the Palemia banned me, I coped really well at the time, but later after I had got stuck into building the housetruck, the stress appears to have triggered a full-blown reaction – delayed shock. My heart failed rather firmly with serious weakening of the pumping, then that caused breathing problems and irregular beating. This is not heart disease (like cholesterol or artery problems) this is purely electro-mechanical. All tests and measurements are AOK except for just the electrical misfiring and weakened muscle. I’ve been into hospital several times and once for an electric [initially successful but then ultimately unsuccessful] shock treatment operation. It’s only recently that the boffins have got on top of it all. Atrial Fibrillation is quite common apparently where the cells in the heart fire off irregularly, so instead of a steady healthy heart going KAR-CHOONK, KAR-CHOONK, you can get a KAR – kar – CHOONK – kar – kar CHunk – chunk – chunk. Make sense? That’s me! The heart’s pumping efficiency drops; less blood getting circulated means less oxygen to the body, water can rest on the lungs and cause you to get puffed and short of breath and the poor little heart muscle gets exhausted and tired. And that’s me again! I had three echo scans – that’s like the baby scans which measured the heart’s pumping efficiency at 35-40% then 30-35% then 25-30%, so every time I went into hospital it was worse. Heart pumping efficiency should be 60-70% so over the last 6+ months I went from 2/3 to 1/2 to 1/3 efficiency – not good! Heart rate in the last visit was from 80-140 – it should be from 50-80, but all other tests came back fine. Blood pressure has always been fine. Their angiogram test reported clear healthy arteries; my thyroid and all other mineral tests came back normal so I’ve just been stabilised and sent home to take it easy for 3-4 months (yes months!) to let my dicky ticker get a little less dicky! Thankfully the government understands my situation and helps out with the bills a little every week – nice people that they are! One day soon I’ll be all back in business and raring to pay tax . . . So there you have it. A catch up for those who have wondered the latest. I still blog, investigate, ask questions and sticky-beak into where the crims, crooks and crazies try to hide. I still put those opinions out there for Google and the good people to catch up on. The world keeps on spinning at around about the same rate as it did last year and the greedy and the deceivers still steal and lie . . . looks like Writing the Wrong is in the Right business eh? Sometimes I find it depressing watching how people treat others – especially those in positions of power over others, but I know that even though people like Tuila’epa can just give others the flick because they are getting a little close for comfort; or how the BBX people scramble to keep up appearances and keeping their frauds afloat for just a few months more . . . at the end of the day, there is a God; He does know it all and there is ultimately accountability based on truth. That keeps me going, doing what I do no matter the results for the moment. Thanks for swinging by, and check back soon if you’re interested in the gossip about Samoa and the coward that leads the show up there . . . much more to come in the coming weeks! [Americans are] wilfully ignorant . . . It’s called “The America Dream” because you have to be asleep to believe it!